If you're looking to make your summer party or special event unique and fun, 2 Dad's Bounce Houses have the just what you need. 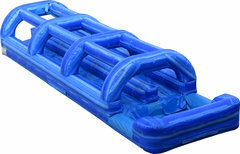 We have the best Phoenix water slide rentals available. Water slides are a great way to stay cool on those hot summer days. 2 Dad's has a wide variety of water slides for kids and adults, including a water slide and bounce house combos, stand-alone slides, and giant waterslides. 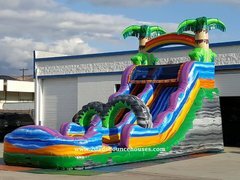 When you're looking for Phoenix water slide rentals for your party, you want something that not only fits your needs and budget, but that is safe and clean. 2 Dad's Bounce Houses makes safety and quality a top priority. 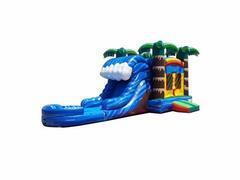 Our large variety of water slides fits every need and budget for your big event. Water slides are great for just about any event; birthday parties, corporate events, fairs, charity, and fundraising events, picnics, or as a special treat in the backyard. 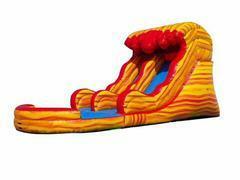 This 21-foot inflatable water slide has 2 lanes and a large curl at the end for sliding and rolling. It's suitable for kids and adults and the bright colors will match any theme for your party. Our 40-foot slip and slide is perfect for those hot summer days and is suitable for adults and kids. All you need is a standard water hose and the misting system will do the rest. 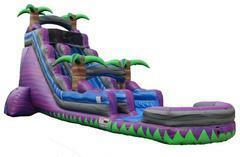 For those summer kids parties, our bounce house and water slide combos are a real treat. 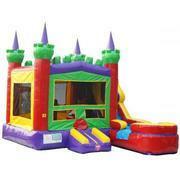 Our 6 in 1 Majestic Castle combo can be used wet or dry. 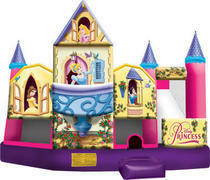 It comes with a bounce area, climber, water slide, and a small obstacle course with hoops inside and out. It's sure to provide the kids with hours of fun. 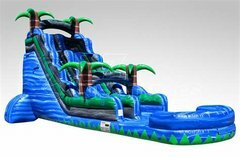 Our highly trained staff and customer support will take you from choosing the best water slide rental in Phoenix to setting up and taking down the equipment. All of our staff are experienced operating all of our equipment. This means you can leave the work to us while you enjoy your party. We also have a 24/7 support line should you run into any issues with our equipment. All of our equipment is cleaned and disinfected before and after each use. It is also tested regularly to ensure safety, cleanliness, and customer enjoyment. 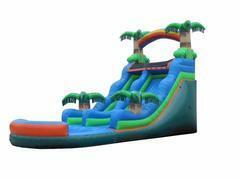 2 Dad's Bounce Houses has the best quality water slide rentals in Phoenix and it's surrounding areas. We also offer fast and simple online reservations to make the planning process less stressful. So for the best Phoenix water slide renatls, let 2 Dads provide the fun! Our business is family owned and operated. Our goal is to create a fun and memorable party experience that focuses on safety. 2 Dad's is fully licensed and insured, as well as being certified by the industry leader in bounce house and inflatable safety, SIOTO. 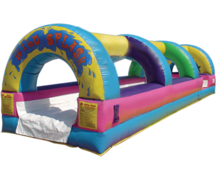 If you're planning your next event and need the best and most reliable water slide rental Phoenix has to offer, give us a call today!